They mostly come out at night. Mostly! It took me 6 months to make this costume. I bought the latex pieces from a prop maker for $1000 and had to piece it all together. 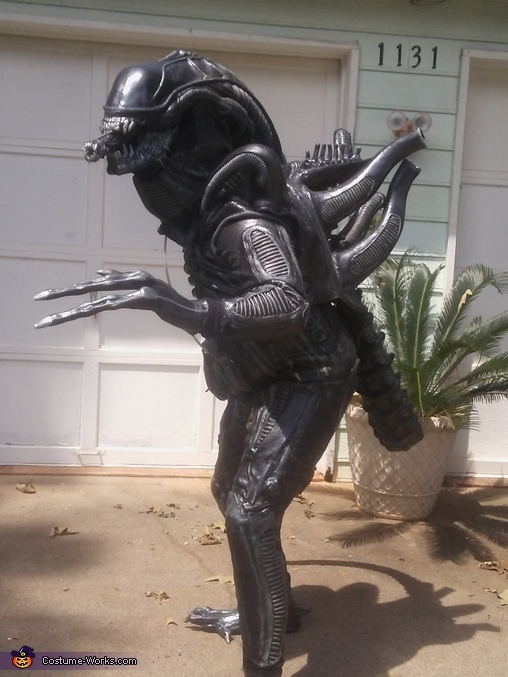 I wear the costume and I use it at Dragon Con, Halloween, and to scare my wife when she comes home from work. I have made a mechanism to shoot the inside tongue out. Same here. How much to have one made for me and to ship to Indiana. My number is 574-216-0070. If I don't answer leave a message and I call back. I bought the latex pieces off a seller named Monsterroom on ebay. He still sells the kit. It will cost you about $1000 for the kit and you will need to attach the pieces to a lycra suit or wetsuit then paint it with plasti-dip paint. This costume was a one off for me and I do not take commissions for them.